Next story in Decade in Review Will next decade be another bubble-popper? 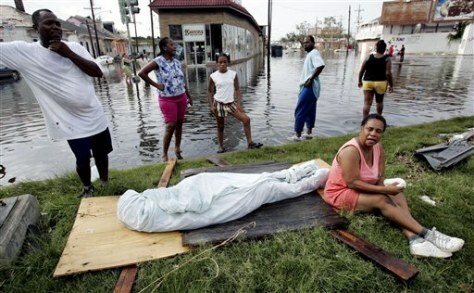 This Aug. 30, 2005 file photo shows Evelyn Turner, right, with friends and family, waiting with the body of her common-law husband, Xavier Bowie, after he died in New Orleans. Xavier and Turner had decided to ride out Hurricane Katrina when they could not find away to leave the city. Xavier, who had lung cancer, died when he ran out of oxygen.